Discover how an understanding of God’s love for man can heal disease, redeem past mistakes, and restore harmony in your life. 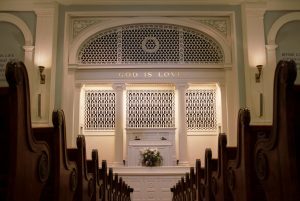 As one of the many worldwide branches of The First Church of Christ, Scientist, in Boston, MA, our church is “designed to commemorate the word and works of our Master [Christ Jesus], which should reinstate primitive Christianity and its lost element of healing” (Manual of The Mother Church by Mary Baker Eddy). Our members unite with this church, in part, out of gratitude for healings they’ve experienced through their deepened understanding of God’s unfailing, universal love. We are a Bible-based, Christian church with many resources available to support your spiritual growth. You are always welcome! Sun 11 a.m. – 12 p.m. Wed 7:30 – 8:30 p.m. The Discoverer and Founder of Christian Science, Mary Baker Eddy defined Christian Science as “the law of God, the law of good…” (Rudimental Divine Science). Her lifelong spiritual search and study of the Bible revealed that God’s law is a powerful spiritual principle, always present and operating to heal and bless humanity. Jesus’ ministry demonstrated this law of God in practical Christianity, proving that healing and regeneration come as we recognize our true nature as spiritual and made “in the image of God” (Genesis 1:27). Examples of this can be seen in the biblical accounts of Abraham, Jacob, Moses, the prophets, and Jesus and his immediate followers. This focus on spiritual healing, illustrated in the Bible, is central to the study and practice of Christian Science. 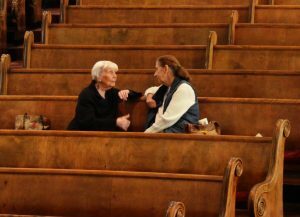 Our Sunday service is based on weekly Bible Lessons made up of selections from the two books that serve as our Pastor: the Bible and Science and Health with Key to the Scriptures by Mary Baker Eddy. The week’s Bible Lesson is read during every Christian Science service in churches around the world and can be studied during the week before the Sunday service. Children and young adults up to the age of twenty are welcome to attend our Sunday School. Early lessons on the Ten Commandments, the Lord’s Prayer, and the Sermon on the Mount form a foundation for Christian living. 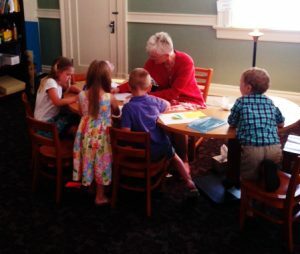 Later lessons involve discussion of the weekly Bible Lesson, and students learn how to apply the principles of Christian Science to today’s problems. Bible stories are an integral part of all classes, emphasizing the spiritual truths and timeless lessons found throughout the Scriptures. Our Wednesday meetings include brief topical readings from the Bible and Science and Health with Key to the Scriptures, followed by testimonies of healing from members and attendees who are applying Scriptural truths to their lives. Childcare is lovingly provided for children not yet ready for Sunday School or the Wednesday evening meetings. Get directions to our church. Free parking is available on Westminster and in the adjacent lot. Mary Baker Eddy ordained the Bible and the Christian Science textbook, Science and Health with Key to the Scriptures, pastor of The Church of Christ, Scientist. Our Sunday Service and Wednesday meetings include selections from both books. Our Reading Room is a great place for spiritual study and prayer. A church member is on duty to answer any questions you may have. You can study the Bible and Science and Health with Key to the Scriptures, read Christian Science magazines, read or listen to a wide range of articles on JSH-Online, listen to inspirational music, and pray. You can also borrow or purchase a variety of books, magazines, pamphlets, CDs, and items for children. 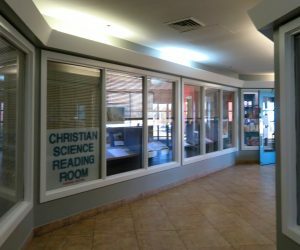 Our Reading Room is located in the Clara Arcade building on Delmar Boulevard. Free parking is usually available in the lot adjacent to the entrance. Metered parking on Delmar is always available. Get directions to our Reading Room. M, T, W, Th, F, Sat: 10 a.m. to 2 p.m.
Christian Science practitioners and teachers are experienced in the healing ministry of Christian Science. Many are available 24/7 every day of the year devote to help others solve problems and find healing through the prayer-based system explained in Science and Health with Key to the Scriptures by Mary Baker Eddy. Their services are available to the public and range from answering questions about Christian Science to providing prayerful treatment for health, relationship, or financial problems or any other kind of challenge. 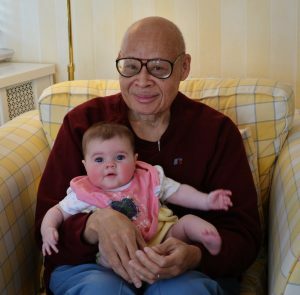 Christian Science nurses are trained to provide skilled, non-medical care for patients working with a Christian Science practitioner. Find a Christian Science practitioner, teacher, or nurse in the worldwide directory. Christian Science lectures explore the healing truths of Christian Science and provide information about Mary Baker Eddy and her discovery of the law of God, illustrated in the life of Christ Jesus. Each year, our church sponsors at least one lecture in the community and one at a local jail. 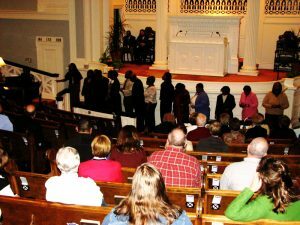 There are several other Christian Science churches in the area that sponsor lectures, too. Find a lecture near you. Our church works with the Christian Science Joint Institutional Committee of Missouri to share Christian Science in prisons, mental hospitals, and juvenile facilities in our community. 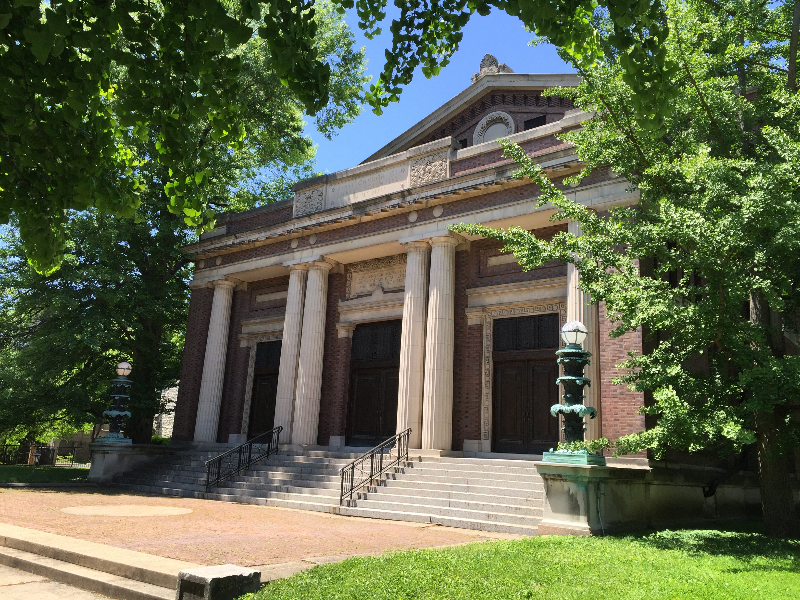 Our church is a member of the Holy Ground Collaborative, an interfaith group composed of six congregations in the Central West End’s Holy Corners Historic District. 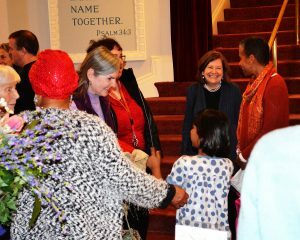 Established to address community needs, foster peace, and provide opportunities for interfaith fellowship, the Collaborative plays an important role in our community. Read inspirational articles and testimonies of healing from the Christian Science Sentinel, Journal, and Herald. If you would like to make a donation to First Church of Christ Scientist, St. Louis via Credit or Debit card, you can do so via PayPal by clicking on the Donate button below.